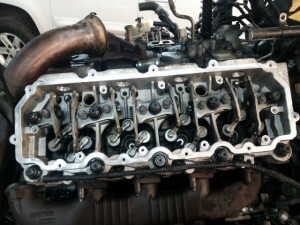 « Another 6.0L Head Gasket Job! 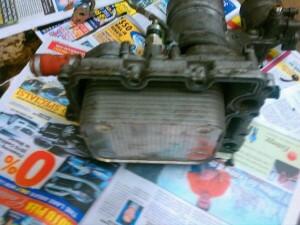 Here is the factory Ford Engine Oil Cooler still mounted in the Oil Cooler housing. 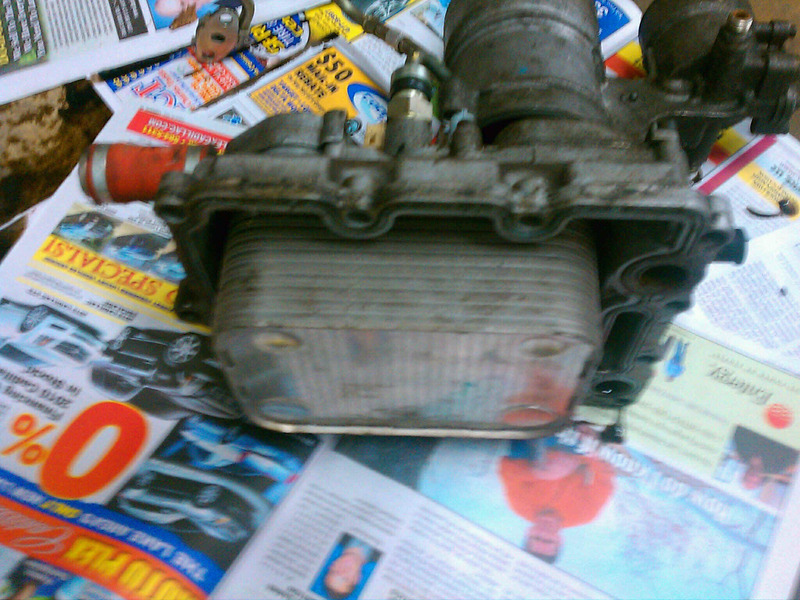 Which resides in this High Pressure Oil Pump reservoir in the center of the block….Notice the torn elements on the HPOP oil inlet filter….all that screen and the trash in the screen HAS gone through your HPOP and IPR. 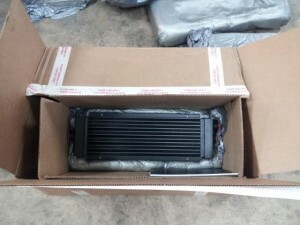 You can replace this engine oil cooler and screen…..but in three to four years or fifty thousand to sixty thousand miles, you WILL be right back here AGAIN. Period. 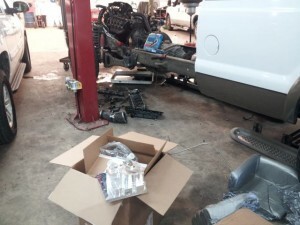 Coolant filtration kits do NOT help….the crud that restricts this cooler is NOT coming from elsewhere in the cooling system, IT FORMS right here WITHIN the cooler itself. 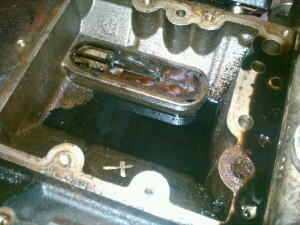 The above two pictures and video is the result of the chemical reaction that occurs WITHIN the oil cooler. It is NOT casting sand. It is NOT trash that forms elsewhere in the cooling system. It CANNOT be filtered out. 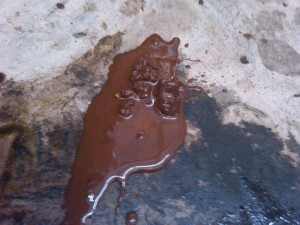 ELC coolant of a different brand like Caterpillar may slow it, but is will NOT prevent it. It cannot be FLUSHED out. 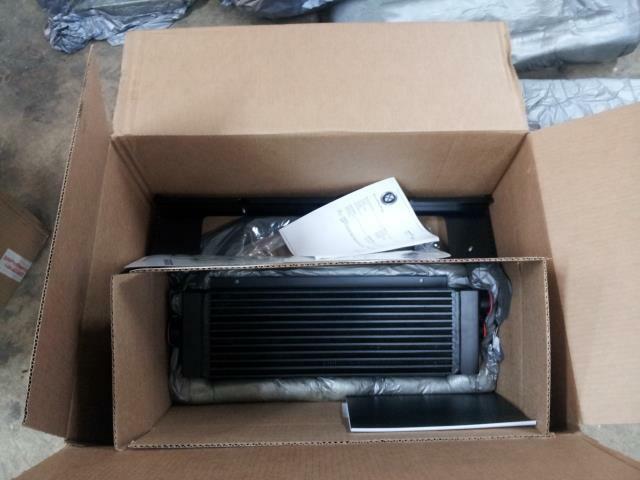 The ONLY solution is to replace the factory style cooler ever time it’s performance degrades, OR to replace it once and for all with a Bulletproof cooler kit. The decision to “Bulletproof” your truck or not all centers around whether you use the truck as it was intended; towing travel trailers, equipment trailers, livestock trailers, larger boats, etc. 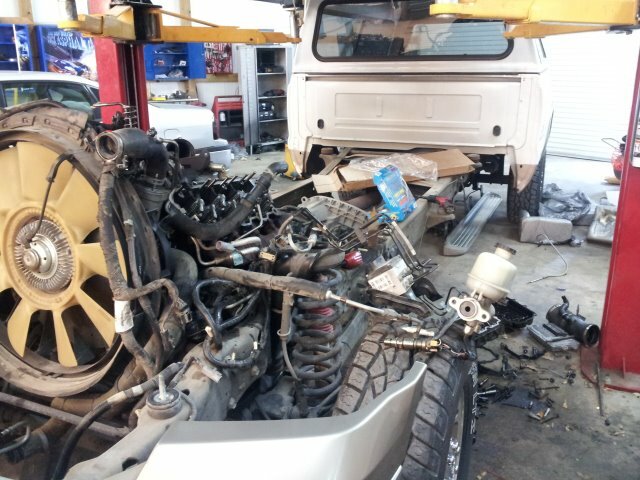 If you use the truck as a truck, then you should go for the Bulletproofing versus just using the factory design replacement parts. Another factor is how long do you plan on keeping the truck. 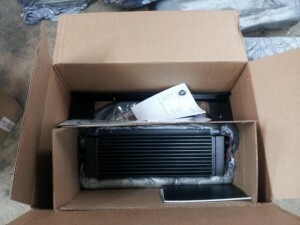 If you are going to repair the truck and get rid of it within 12 to 24 months, then go factory style parts. If you plan on keeping the truck for the next 3 years or more, then go with the Bulletproof style parts. 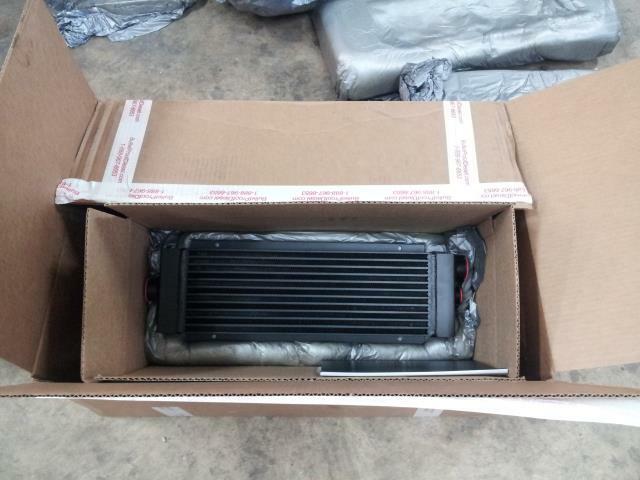 These trucks will EASILY last 15 years and 400,000 miles if maintained properly….if you have to do the factory cooler again in 3 years, you will have spent what it takes to do the Bulletproof setup now, so if long term is your objective, go the Bulletproof route. Even if your truck is in POOR shape needing 8 injectors, a HPOP, IPR, FCM, head gaskets, etc, you are STILL only looking at spending roughly $11-14,000 on it……a NEW truck is over SIXTY THOUSAND. We have lots of these trucks that came in the shop at a year or two old in 2005 on up in POOR condition due to accidental neglect…just not knowing all the things discussed on this page…the customer took the plunge and had us pull the cab and do head gaskets/studs and all the required repairs and Bulletproofing that have now been driving these trucks for years…many now having over 300,000 miles on them. In today’s new truck market, it CAN BE a prudent decision to dump $10,000 or more in a truck so you can drive it another 10 years with new trucks costing what they do and no guarantee you will get 10 years out of the new one without having a large repair bill. Unless you plan to start buying a new truck EVERY time it runs out of warranty, you ARE better off financially spending a few thousand fixing your current truck….provided it is sound cosmetically. 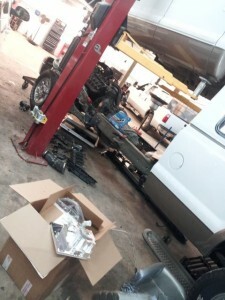 If it is totally ragged out inside and out, then no….it is not worth dumping $10,000 into….if it is still a good looking truck and you otherwise like it and planned on keeping it a while before it broke, then it’s just crazy to spend $65,000 when you can spend a less than a quarter of that. If you spend $10,000 on your truck and keep it just a year, you are STILL ahead of the game, because you will spend more than $10,000 in a year on a new truck anyway. 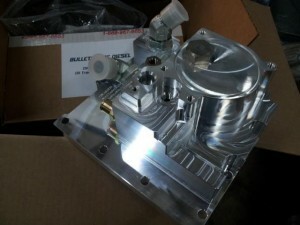 This project below is one of MANY that got new cylinder heads, new high pressure oil pump, new IPR, new injectors, new fuel pump, revised fuel pressure regulator, revised high pressure oil rail fittings, ARP studs, Bulletproof oil cooler kit, EGR delete or bulletproof EGR cooler, etc for less than $15,000 and the customer is STILL satisfied with the truck a few years later……..and he still has all the money they saved by not buying a new truck. Choosing to fix your paid off or soon to be paid off truck versus buying a new one is a NO BRAINER unless you just make that much money and you need a huge deduction and can actually write off the cost of a new truck…. Although not AS prevalent, the above engine oil cooler issues apply to the 6.4L Powerstroke ALSO! 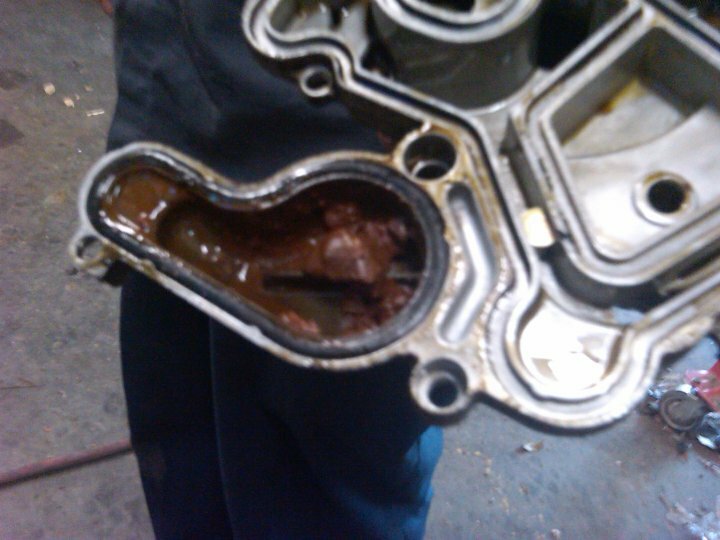 We have seen NUMEROUS 6.4L trucks come in with a customer complaint of random reduced power mode/wrench light and found Oil Temp/Coolant Temp delta codes, and under stress testing we find the engine oil temperature running up to 40 degrees hotter than engine coolant temperature due to the engine oil cooler being restricted. 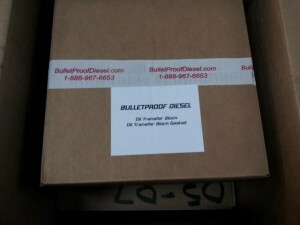 Bulletproof Diesel ALSO makes a kit for the 6.4L Powerstroke. We are a dealer/installer for Bulletproof products. The prices you see on their site is the price you will pay here. We typically keep a kit in stock.